The American Chemistry Council (ACC) releases its Global Chemical Production Regional Index (Global CPRI) for February with the headline index rising 0.2% on a three-month moving average (3MMA) basis. This follows a 0.4% gain in January and a strong 4th quarter. During February, chemical production rose in North America, Western Europe and Asia-Pacific; was flat in Africa and the Middle East, and fell in Latin America and Central and Eastern Europe. The Global CPRI was up 3.4% year-over-year (Y/Y) on a 3MMA basis and stood at 110.1% of its average 2012 levels in February, according to ACC. During February, capacity utilization in the global business of chemistry slipped slightly to 81.6%. This is off from 81.9% last February and is still below the long-term (1987-2015) average of 89.2%. All segments of the business of chemistry have improved from the trough of the recession with the most pronounced recovery having occurred in the cyclical segments, according to ACC. During February, results were positive, with production of manufactured fibers, synthetic rubber, inorganic chemicals and coatings as weak segments. 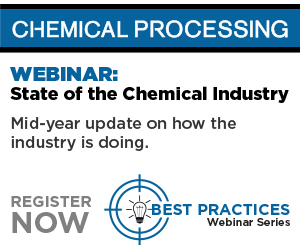 Considering year-over-year comparisons, chemical production increased in every category. Growth was strongest in plastic resins followed by pharmaceuticals, consumer products, manufactured fibers and other specialties. Other segments featured more modest year-earlier comparisons. ACC's Global CPRI measures the production volume of the business of chemistry for 33 key nations, sub-regions and regions, all aggregated to the world total.